This workshop will cover Title IX issues as well as related concerns for faculty. 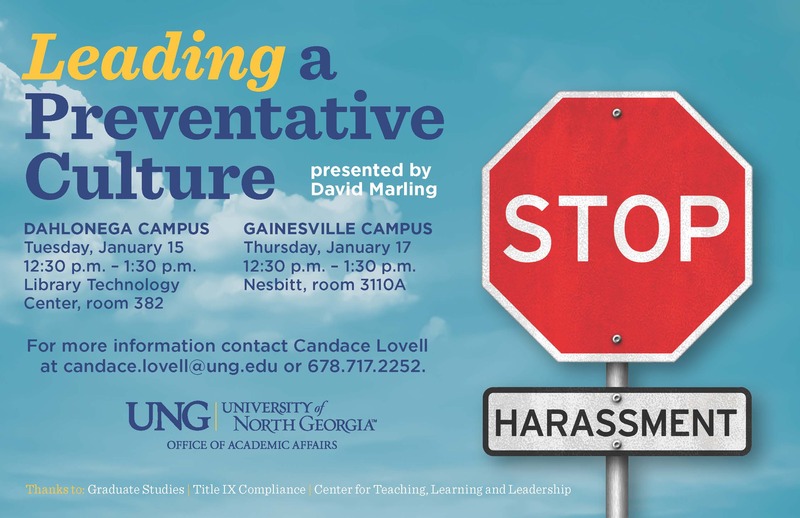 Topics will include setting appropriate boundary issues with students and common Title IX concerns in the context of classroom discipline, disruptive behavior, and the process for reporting Title IX concerns and other academic and behavioral concerns. University process and procedures for all of these related areas will be explained. They will also share some information about other ways the Deans of Students can help you and your faculty with questions and concerns that come up during the year, including hardship withdrawals and general student conduct information. There will be two sessions covering this material. One on the Dahlonega Campus and one on the Gainesville Campus. Both sessions will cover the same material.